Where driver confusion results in a road construction collision, we have frequently found errors in the Maintenance of Traffic Plans, or failure to implement it caused injury or death that could have been avoided. Haphazard "men working" signs and barricades are not enough. Lighting, flagmen, signage, and other measures must be included in a comprehensive program to prevent catastrophe during road maintenance and construction. We have worked with traffic engineers in numerous highway crashes to find contributing causes besides obvious driver error. Road hazards are anything that a driver must be cautious of and anything that poses a potential threat to safe travel. Not only do we have to worry about distracted drivers, faulty car parts and deceptive insurance carriers, but we also have to be mindful of dangerous road conditions. Road hazards occur all around us and yet, some of us may not even notice what they are. When a pedestrian falls into the crosswalk, this is considered a road hazard. A child who runs into the street chasing after their ball is another road hazard. As with hurricanes and other bad weather, debris such as tree branches may fall into the road and become dangerous for oncoming vehicles. Pedestrians, animals, debris, potholes and uneven roads are the most common road hazards, and they have been known to cause numerous accidents. Man-made road hazards during road construction is another common hazard for the motoring public. 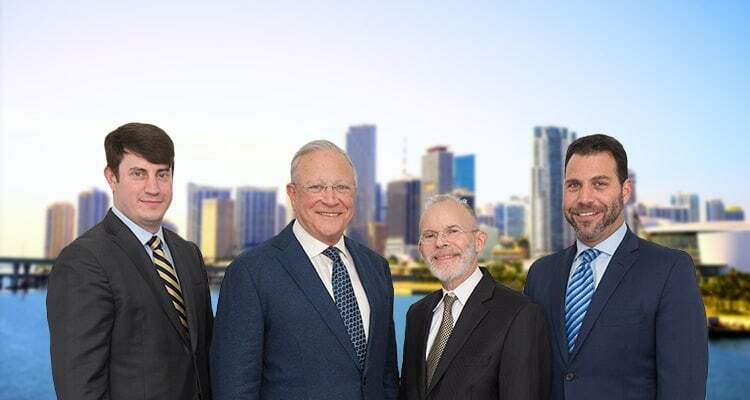 Miami injury lawyers at Gerson & Schwartz PA are known for their knowledge of road hazard accidents. Now, we want to use this expertise to help victims like you. Representing personal injury victims throughout South Florida, our skilled Florida accident attorneys know how to prove dangerous road hazard conditions that are present on the road. We want you and everyone to arrive to your destination safely. However, if you do find yourself in an accident due to a road hazard call a Miami, Florida based accident attorney for a free consultation at (305) 371-6000 or e-mail us at info@gslawusa.com. We want to provide you with the resources and information necessary for you to gain an understanding of the legal process behind road hazard cases and how you can be fully compensated for your injuries. So do not hesitate, contact us today. Fortunately, better engineering and advanced materials science have lessened road hazards. Reflective devices, pavement markings, barrier walls, and automatic warning devices built into luxury automobiles have helped mitigate road hazards. But when a natural disaster occurs, the more prevalent road hazards become and they still manage to threaten our safety. Since tax dollars are needed to improve our streets and highways, many hazards still exist with no intention of being solved in the near future. Only government can do the job and public support for improving our infrastructure must be strong. Both federal and state Departments of Transportation require "maintenance of traffic" (MOT) engineering and record keeping to make road work safe for workers and drivers alike. Remember to check the news before you head out on your daily commute for traffic reports and road hazards. Florida also provides a statewide website to inform the public about potential road hazards. However, be aware that not all road hazards are reported to the press, and you should drive carefully. If you happen to see a work zone, uneven pavement, foreign objects on the road or are approaching a ramp, then slow down and proceed with caution. There are, of course, other hazards that may occur more frequently than others, such as someone getting out of a parked vehicle, delivery trucks blocking your vision, bicyclists that suddenly dart into your lane or people fixing their vehicles on the side of the road. Due to the numerous amounts of hazards, it is not unlikely to find yourself in an unfortunate accident. If you are involved in an accident due to a road hazard, be sure to report the accident to the police. You may also want to call an experienced attorney to see if you are entitled to damages.